We are pleased to offer an affordable Pinewood Derby Timer System for 4 Lane tracks. Everything is included to install the hardware on your track. The software runs on Windows 7, 8 and 10. Our 4-lane Pinewood Derby Timer System is economical but it does have a lot of features. NOTE - We have a new version of our software that does not need or use Excel. The software stores the Cub Scout race information in text files. There is an option to find the average race time or the fastest at the click of a button. It also displays the results of the previous race together with the current winning cubs. The system is complete and includes everything (hardware and software) for a four-lane track (minimum 2 and maximum 4). You can use this system on any track with from two to four lanes. It is completely adjustable in both the hardware and software. The hardware includes a start gate and a finish line with four finish line sensors. The sensors respond to room light and are easy to install under each track lane. 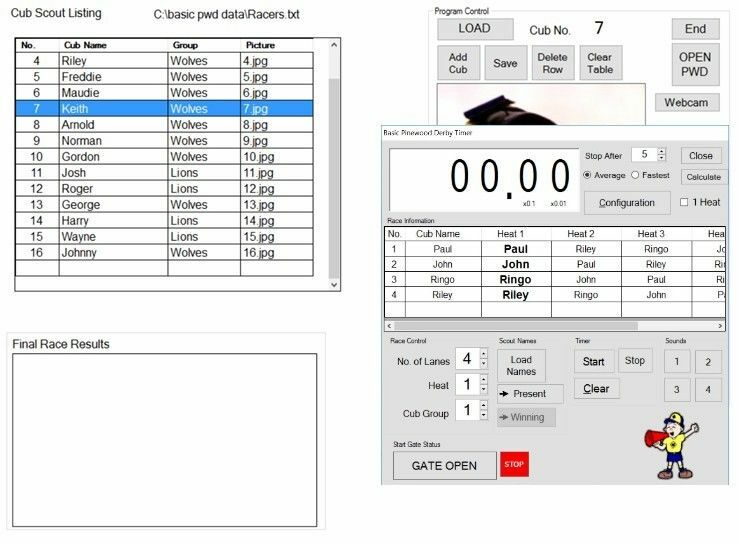 The race clock is in the computer software and is started when you open the start gate. 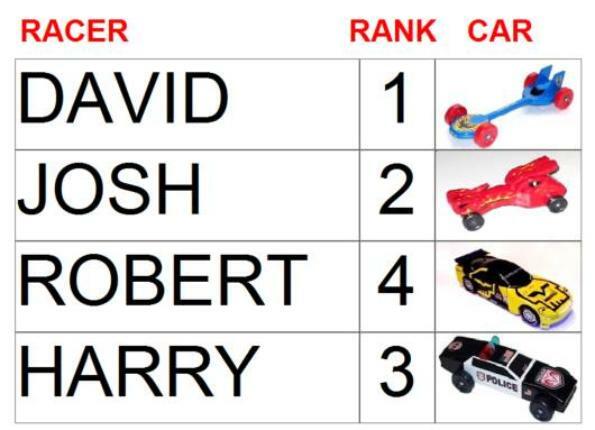 A Pinewood Derby race takes about three seconds. The race clock runs for 10 seconds but can be easily adjusted for a shorter time that you can choose. 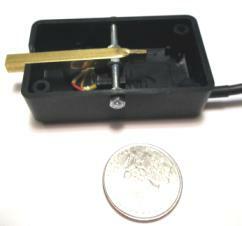 The electronics hardware is mounted in a small black box. The USB cable is on one end. This cable connects to the computer. The sensors connect to 4 jacks on the opposite end. There is also a test button that you use to test the sensors. The sensors work very well indoors. They will not work outside in the sunshine. An led in the center of the box shows the status of the start gate. There are four led lane indicators that show the status of the sensor in each lane. The led lane indicator will turn on when the sensor is tripped and when a car crosses the finish line. This unit is easy to use and connect. Everything is done from the computer. The sensors respond to room light. YES no need to have to adjust an IR transmitter led to make sure it strikes an IR sensor located in the track. The start gate is shown below. This track has three lanes. The levers protruding from the track drop down when the race starts. The finish line has an overhead bridge and two posts. All the pieces are made from pinewood. The software has a new feature that many have requested. You will now be capable of racing all your cub scouts for each heat. Then race all of them in the next heat and so on. This allows the cubs to race more frequently and be kept busy. 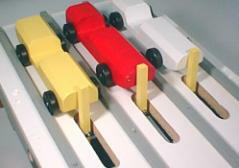 The old way had a group of four cubs race their cars in four heats then be finished racing. There is nothing worse than having bored cub scouts on race day. Not to worry, the software will work either way. It is very flexible. 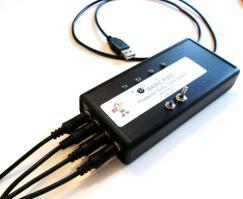 The software contains a timer that backups the race data in the event of a power outage or problem. The timer frequency can be adjusted to perform a backup every minute to every ten minutes. Most Pinewood Derby timers are accurate to 1 millisecond (3 decimal places). Our timer is far more accurate and gives time measurements with 7 decimal places. The program window to the left shows the decimal places that are measured. A typical race takes about three seconds so these cars are fast. There will never be any arguments when the times are compared. Your race winner will never again be determined by whose father can yell the loudest. We are joking of course (or are we?). The software is written for Microsoft Windows computers running Windows XP, 7 through 10. Our timer system connects to the computer with a USB connection. There are also sound effects that can be accessed by clicking on buttons. “Gentlemen start your engines” is one very familiar sound. Included with the system is a webcam. At your race registration the webcam is used to take a picture of each cub’s car. A picture of the car alone can be taken or a picture of the cub holding his car. Each cub will be registered with a number. The first cub is number 1, the second cub is number 2, etc. You can devise your own numbering system if you like. The picture is stored using the cub’s number. The picture for cub 1 would be stored as 1.jpg. The advantage of using the included webcam (instead of a digital camera) is that the picture file can easily be numbered and saved directly on the computer in the appropriate folder. If a projection screen (or second monitor) is used then the pictures can be displayed along with the winning race information. After all the cub pictures have been taken (at registration) the webcam can be placed at the start gate to show the cars at the start of each race. 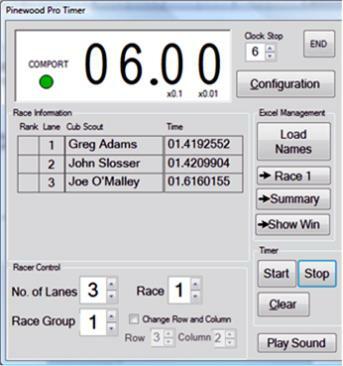 There are buttons in the software to display the webcam image and also race information. You do not have to use the webcam or have pictures to use the system. Each cub should get some recognition for all the work that was put into building his car. What better way than to show a picture of his car on the projection screen. A few people have asked if our system can be used outdoors in the sunshine. Normally the sun plays havoc on our light sensors. We would now like to announce our new sunshine sensors. They plug into our system and work like the regular sensors except they work out in the bright sunshine. They will also work indoors too. A brass lever arm (3/16" square) is mounted on an axle. The lever protrudes though a slot that has been cut in your track. When a car passes over the sensor, the metal arm gets pushed down into a horizontal position; allowing the car to pass. 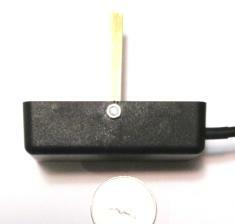 The lever trips the sensor light beam when it moves from a vertical position to a horizontal position. This is a simple idea. The quarter coin in the picture shows the size of the sensor and black box. The box measures 2.36” x1.38” x.79". 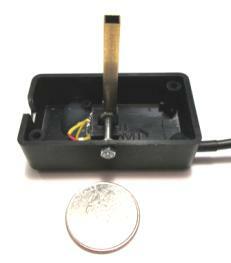 The black box sensor mounts under the finish line in each lane with two screws. It connects to the system, black timer box, with a 3.5mm cable and plug. 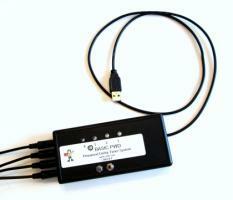 Please let us know if you desire to purchase our new sunshine sensors. This system includes all the hardware and software necessary for you to run a Pinewood Derby race with your cub scouts. The system will work on tracks with from 2 to 4 lanes. The software runs on Windows 7, 8 or 10. A USB port is needed on your computer. This system costs $229 and includes everything described above. Click on the button to buy this item. Please allow two weeks for delivery. We ship using USPS Priority Mail. Have a question? Need something slightly different? We would like to hear from you!